Daedra Counts are formidable, highly intelligent foes. They can cast a variety of spells, but also have powerful melee attacks. If spoken to, they may offer up some useful information, but will likely attack. The Daedra Lord is one of the most powerful Daedra to be commonly seen in Tamriel, and is to be feared by all but the most experienced adventurers. They are powerful fighters and spell casters, and can only be harmed by mithril or better weapons. These are scantily-clad, feminine Daedra that may sprout green membranous wings. They are about equivalent in power to the Dremora, and are, like them, divided into many castes. They are powerful spell casters and can only be harmed by mithril or better weapons. Seducers are found in service of many Daedra Princes, notably Azura, Meridia, Nocturnal, Sanguine, Sheogorath, and even Mehrunes Dagon. Daedrats are Daedric vermin resembling small rats, but with glowing blue eyes. Daedric Titans, commonly referred to simply as Titans, are giant winged Daedra that serve Molag Bal as war-slaves. 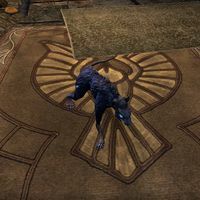 They were first created in imitation of the dragons of Nirn when Bal's interrogation of Boziikkodstrun proved fruitless. After modifying Boziikkodstrun's skeleton and substituting his soul for a Daedric vestige, Bal transformed him into the first Titan. Daedric Titans are anatomically similar to dragons, although with dark black skin and prehensile frontal limbs. They have the ability to speak a spell of flaming essence-drain that can debilitate an opponent with a single word, similar to the power of the thu'um. They are notoriously difficult to kill. According to some sources, Titans were released upon Tamriel for the first time[nb 1] during the attempted Planemeld of the Second Era. Specifically, Molag Bal released them into the skies over the Imperial City when a portal to Coldharbour was opened above the White-Gold Tower in 2E 582. Daedric Titans quickly came to serve other Daedric Princes such as Boethiah, who forced them to fight for her amusement. Mehrunes Dagon imbued a Titan with some sort of flame magic, creating an even stronger variant known as the Ash Titan. In an attempt to create a kind of immortality, Sotha Sil bound the soul of St. Olms and created the Clockwork Titan to harness its power, allowing Olms to inhabit the body of this mechanical variant. 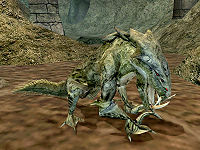 Daedroths are crocodile-headed bipedal Daedra, associated with Molag Bal and Mehrunes Dagon. 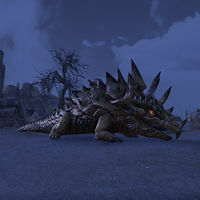 They are a strong, animalistic type of Daedra, but still a dangerous foe with powerful clawed arms and moderate magical ability. Though some have been known to use weapons and wear simple armor, most attack with bare claws. Some are man-sized and spit poison or shock magic, while others tend to be larger and belch firebolts instead. These larger Daedroths initiate battle by shaking themselves, invoking a protective shield. Linguists will point out that "Daedroth" is also the proper singular form of "Daedra", but for these creatures the common usage is Daedroth (singular) and Daedroths (plural), with Daedra (both singular and plural) being used as the generic term. The more proper, specific name for them is "Daedralings". 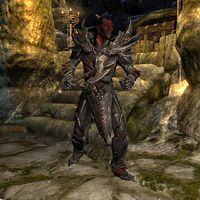 The term "Lesser Daedra" is sometimes used (again, both singular and plural), though this appellation technically refers to Daedra of all types beneath the Daedric Princes. 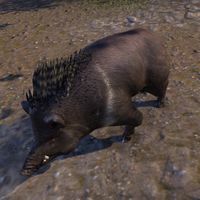 Daggerbacks are boar-like creatures with quills found along their backs. 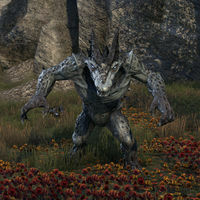 Although this type of Daedra is intelligent, many of them normally refuse communication with anyone from Mundus. Dark Seducers are both powerful spell casters and melee fighters. 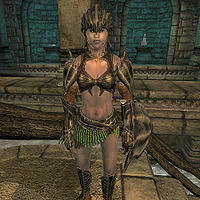 They are related to the Daedra Seducers, 'dark' likely signifying a variation in form or a specification of rank. Those in service to Sheogorath call themselves the "Mazken", and are usually friendlier to mortals. 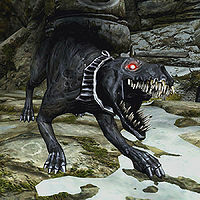 Death Hounds are monstrous, undead canines who can often be found in the company of vampires. They have a bite as cold as the grave, which deals magical frost damage. Their meat is edible, and they often wear valuable collars. See also: Bonewolf, Hell Hound, and Skinned Hound. 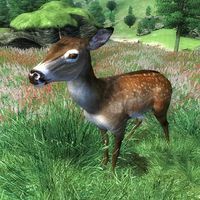 Deer are herbivorous mammals seen in the forests of Cyrodiil and Skyrim. They are often hunted for their meat and pelt. They are very skittish and will quickly flee potential danger. 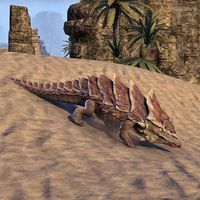 A type of fish that can be found in the Alik'r Desert. The largest known species of wolf, wild packs are feared by farmers and shepherds. 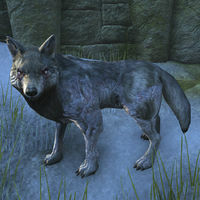 Dire wolves can be found in some parts of Cyrodiil and Skyrim. In the Colovian Highlands, these wolves have been domesticated by foresters into capable mounts. 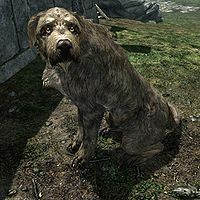 Dogs are domestic animals common in most of Tamriel. They are often held as pets, guarding and protecting their owner's property. Bandits will often train their dogs to protect camps and attack intruders. Huskies are a variant of dog. A playful aquatic creature, often seen off the coast of Stros M'Kai. Doom Wolves are a breed of giant wolf. They have black fur and glowing red eyes, and their howl is unnaturally distorted. 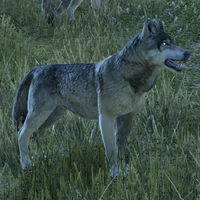 Doom Wolves are used as mounts and were bred for size, savagery, and stealth from the fierce timber wolves of the southern Jerall Mountains. 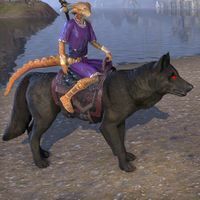 They were adopted by the Dark Brotherhood for use as stealthy mounts, with the breed's glowing red eyes weighing heavily in the decision. 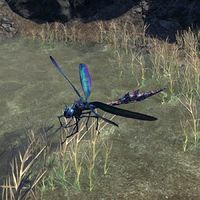 Dragonflies, sometimes called Dovah-Flies, are small flying insects commonly found in southern Skyrim and around bodies of water in the Azura's Coast, Bitter Coast, and West Gash regions of Vvardenfell. A number of varieties exist, such as the Blue and Orange Dartwings, white Regal Dovah-Flies, and a number of mechanical Fabricant variants from the Clockwork City. It is unknown whether the fly variants are different breeds or merely color variations. Dartwings are prized for their use in alchemy. If hand-raised from larval form, they can become devoted companion, and a common children's sport in Vvardenfell called "dodge-dovah" involves dragonflies. Once believed to be a young form of the mysterious dragons, Dragonlings are actually unrelated, weaker specimens. Although they have no spell casting ability, they can still breathe fire and pose a fair challenge for the average adventurer. They can be calmed by speakers of Dragonish. The relationship, if any, of that language to the Dragon Language spoken by actual dragons is unknown. Draugr are a form of ancient Nord dead found in Skyrim and Solstheim. Draugr retain many of their former human skills and thus can greatly differ in their combat preferences, much like living humans. 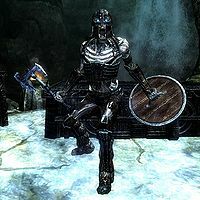 Some draugr will charge in on intruders wielding their battleaxes or greatswords, while others keep their distance and use their bow and arrows, yet others are very proficient with magic and can sometimes even be seen summoning high-level Atronachs. 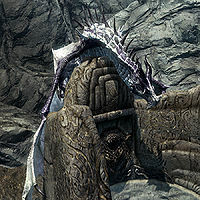 Draugr speak using the Dragon Language, and are also known to have the ability to use the Thu'um. The variety found in Skyrim dwell within ancient Nordic barrows and are usually associated with the Dragon Cult. 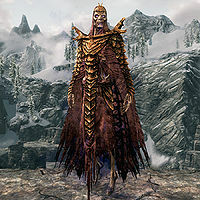 In life, many were followers of a Dragon Priest Over time, the followers' bodies withered despite the ancient Nordic embalming techniques and they became the modern draugr of Skyrim. The variety found on the island of Solstheim are different from their mainland brethren. They were once a tribe similar to the Skaal. Trapped and hungry on the island, they feasted on the flesh of their dead. The All-Maker saw this as a crime against nature, and cursed them to walk the land for eternity as undead, in search of more human flesh to consume. These draugr can often be found in the barrows of the island in search of flesh, and will fiercely attack and devour interlopers. Draugr are occasionally slain as a rite of passage for male Skaal warriors. Draugulfs are an undead type of wolf, presumably named after draugr. They are seemingly rather rare; only the First Era Icehammer clan of Eastmarch are known to have utilized them. Dremora (also known as "The Kyn") are a warlike Daedric race primarily associated with the Daedric Prince of Destruction, Mehrunes Dagon; although they are often found in the service of other Daedra lords. They are commonly encountered throughout the planes of Oblivion. Dremora are known to be highly intelligent beings, and make capable warriors and mages. 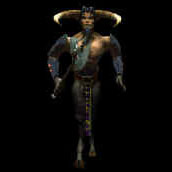 Notable features include horned faces that range from grotesque to resembling tattooed Dunmer, deep ashen grey, blue, purple or red complexions, and voices that are deep and guttural. Dremora society is a class-based clan system that upholds values of oaths, pride, honor and loyalty, both to the clan and to the Daedric lord they serve, whom they also venerate as a god. Dremora culture appears to focus on training and preparing for battle and war. Dreughs are an ancient species of half-human, half-octopus sea creatures, commonly hunted for their hide and the wax from their shells. In the Iliac Bay region, they are rumored to be the remnants of a prehistoric civilization from long before the First Era. For one year of their life, dreughs undergo karvinasim and emerge onto the land to breed. They can be found in waterways as well as the open sea, but are not usually aggressive and largely scavenge for food. Durzogs, sometimes called sludgepuppies, are wild creatures not dissimilar to giant reptilian dogs. They are often domesticated by goblins for hunting, although their own intelligence can rival that of their handlers. They are smart and strong in combat, but not very durable. War durzogs are trained by goblins to be vicious killers. Dwarven Ballistae are animunculi commonly found in Skyrim and Solstheim. They are squat, four-legged constructs and can shoot bolts at enemies for significant, armor-penetrating damage. 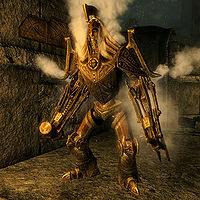 Dwarven Colossi are giant automatons of Dwemer design. 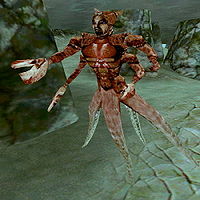 They can be found in certain dwemer ruins such as the assembly lines of Bthungthumz. They were also studied by Sotha Sil and one could be found in his study in the island of Artaeum. A group of Undaunted adventurers encountered one when they accompanied Divayth Fyr into a portal that opened in his home of Tel Fyr that led to the Clockwork City section known as the Halls of Fabrication. 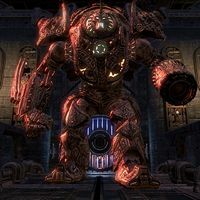 It was a reprocessing facility where Sotha Sil broke down dwemer automatons and the AI known as the Assembly General took control of a Dwarven Colossus, which the Undaunted adventerers then had to defeat. The Morag Tong assassin known as Naryu as well as her Warden companion Boldekh encountered one in the Mundan ruins when she was chasing after the former Morag Tong guild master who went rogue. The assassin and the Warden then defeated the Colosus and Naryu was able to complete her Writ of Execution. 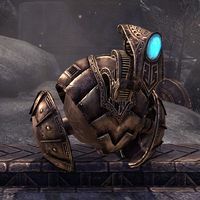 Dwarven Centurions (also known as Dwarven Mechanical Giants or Steam Centurions) are heavily armored constructs with a hammer on one arm and a spring-loaded spike in the other. Some are even able to emit a scalding blast of steam. They are not as common in Dwarven ruins as the lesser Dwarven automatons. They are highly resistant against fire, frost and shock. They are sometimes found attached to a charging gantry when not in use. 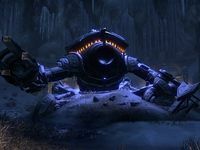 Dwarven Delvers are large Dwemer excavation machines used to dig through subterranean areas. An inactive one was found in the Frostvault, briefly brought back by Tharayya to open up a door during an excavation. They are equipped with a lazer on one arm and a drill in another arm. Dwarven Drone Flies are miniature metal insects that can be found in the Dwemer ruins of Vardnknd. They were created for the purpose of protecting against pollen, mold, and disease within the facility. They are designed to follow an individual and aerate nearby spaces, granting resistances to poisons and improving stamina. 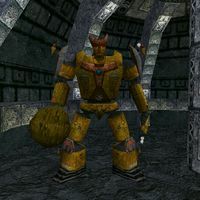 Dwarven Mechanical Giants (also known as Dwarven Centurions or Steam Centurions) are heavily armored constructs with an extendable mace on one arm. It is very deadly and can only be killed if attacked on its heel. 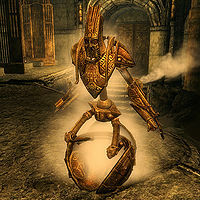 Dwarven Robots (also known as Dwarven Spheres or Centurion Spheres) are a common form of Dwemer Animunculi that have proven to be agile fighters. They patrol ruins in a spherical form until they encounter an opponent. At this point, they will erect into their semi-humanoid form and attack. They are armed with an expendable sword and a shield. Also referred to as Dwarven Theodolites, Dwarven Sentries are spherical animunculi found in the Wrothgar region of High Rock. 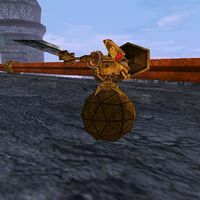 Roughly half the size of their Dwarven Sphere counterparts, Sentries patrol ruins in a similar fashion, extending their necks to emit shocks in order to incapacitate intruders. 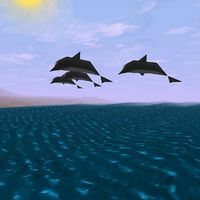 They have been shown to show intelligent movement, as if reacting with emotions. 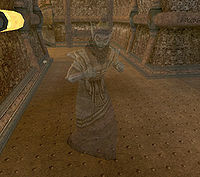 Dwarven Spectres are Ghosts of the ancient Dwemer which can still be found haunting the halls of their ruins. Like all other ghosts, silver weapons are required to harm them. 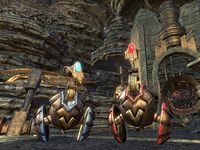 Dwarven Spheres (also known as Centurion Spheres or Dwarven Robots) are a common form of Dwemer Animunculi that have proven to be agile fighters, and are much stronger than the smaller Dwarven Spider. Dwarven Spheres patrol ruins in a spherical form until they encounter an opponent. At this point, they will erect into their semi-humanoid form and attack. They are armed with both an expedable sword and a crossbow. 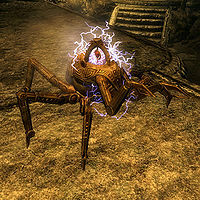 Dwarven Spiders (also known as Centurion Spiders) are small, arachnid-like animunculi, and are very common in Dwemer ruins. They will often be found working on rocks or other objects. They can attack intruders using blasts of lightning. This page was last modified on 26 February 2019, at 22:47.